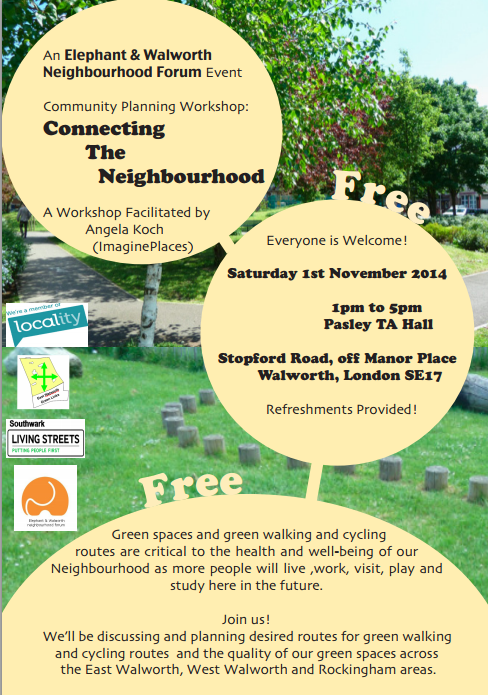 Everyone is welcome to attend the Community Planning Workshop to be run by the Elephant & Castle Neighbourhood Forum on Saturday afternoon 1st November 2014, facilitated by Angela Koch of ImaginePlaces. The aim of the this workshop is to help plan green links and safe routes for walking and cycling across the Walworth and Rockingham areas. The venue is Pasley Hall, Stopford Road (off Manor Place) London SE17 3BP, and the session runs from 1 to 5pm. Refreshments will be provided. The Elephant Amenity Network strongly supports a re-modelling of the northern roundabout at the Elephant and Castle. This roundabout is dangerous for cyclists, unattractive for pedestrians and represents a major block on encouraging local travel by sustainable modes, and any improvement must reduce casualties among vulnerable road users. It should also improve access to buses and tube stations, and re-connect the area around the Elephant to the benefit of local businesses and residents. We agree that change is needed, and urgently, but we feel the two options submitted for consultation fall short of our expectations in several important areas. 1. It is not at all clear how these plans fit with the work currently underway of the Roads Task Force that is looking specifically at the future of the Inner Ring Road. The board report of the Surface Transport Panel 9 April 2014 Item 7: Roads Task Force Update (https://www.tfl.gov.uk/cdn/static/cms/documents/stp-20140409-part-1-item07-roads-task-force-update.pdf) indicates that a study is currently underway into this road, and specifically that there are conceptual ideas for an “underway” at Elephant & Castle. The notes indicate that this report will be ready in “summer” or towards the end of 2014. Clarity on this point is vital. 2. The Elephant & Castle is a dense residential area and is about to see massive increases in residential retail and office capacity. We must have clarity from TfL on how it will work to stop increases in vehicle use, and to stop punishing pedestrian and bicycle use. There is nothing but infrastructure in these plans, and nothing on planning policy and removing long distance traffic. 3. The designs will substantially increase conflicts between pedestrians (including those accessing buses and tubes and at bus stops) and cycles, whilst only reducing – by a limited extent – conflicts between cycles and motorised vehicles. 4. The target for pedestrian travel times across the junction must be to achieve a substantial reduction, as the roundabout represents a major obstacle for short trips to use non-motorised forms of travel. It is a sign of the inadequacy of the proposals in this respect that TfL have said that crossing times for pedestrians will increase in some cases, despite the removal of the subways, given that existing travel times for pedestrians are completely unacceptable now. 5. The design fails to acknowledge the local context and crucial elements are missing. These include the lack of proposals for improving conditions for pedestrian and cycles on the New Kent Road & Elephant Road. 1. The design appears predicated on continuing growth of motorised traffic. This is not appropriate – the local area has a reducing reliance on cars over the last 10 years (lower household car ownership) and making safe conditions for cycling and walking will continue this trend. It is by the same token unacceptable that there are proposals to widen the road even beyond its current enormous width outside Perronet House. There is ample evidence (http://www.bettertransport.org.uk/blogs/roads/170412-phil-goodwin-ltt) that previous forecasts of traffic growth have been consistently wrong. 2. We believe the current designs are dangerous for cyclists in many areas; even though option may be better than A in this respect, there are too many conflict points remaining (particularly with people waiting at bus stops outside the Metropolitan Tabernacle), and no clarity over how the cycle crossing of the peninsula will avoid pedestrian/cycle conflicts. 3. Pedestrian routes in the new design are generally direct and flat, and this is a major benefit. However the journey times that have been released following information requests appear to suggest that there will be no time saving benefit over the circuitous routes by subways, and there will even be a worsening in some areas. This is clearly totally unacceptable – there has to be a time benefit for pedestrians or this whole scheme will have failed. 4. Subway removal has some strong opponents, but also strong supporters; the issue is partly tied to the pedestrian crossing times which, if improved for pedestrians, would lessen the impacts of removal. The subways are seen by some as a “necessary evil” given the volume of traffic and lack of priority to pedestrians, but we believe flat crossings will assist those with reduced mobility. 5. The design generates new conflicts between cycles and pedestrians, including both new conflicts between bus passengers in Option B on the northbound cycle route (as stated in point 2 – how will this be safely delineated in the small space available?). In addition, the biggest pedestrian crossing flow/desire line, Newington Butts to the Northern Line, has a cycle lane along it but no pedestrian crossing. This is designing-in failure. This is because in practice many pedestrians will walk the direct route, on the cycle lane, probably not be given enough time to cross and run into danger with traffic, as well as also making unnecessary conflict with cyclists. 6. Interchange for passengers travelling between tubes and buses is better northbound, but seems to get worse in the southbound direction – we understand that moving the bus stops for buses to Walworth Rd past the Southern Roundabout should reduce the severe congestion that currently exists for pedestrians and those waiting for buses at this stop, but these buses are the ones that are most heavily used, and will mean longer walks for a majority. We would prefer that the public realm was made more attractive at the current site (taking space from the shopping centre) but if not, the designs for the top of the Walworth Rd must recognise that this will be a major conflict point between buses and cycles, and designs must be shown as to how this will be avoided. 7. Access between the Bakerloo, northern and Thameslink is critical – where is the plan for this? Why is the opportunity not being taken to bring this key interchange together? Where is the imagination? Where will the main access to Thameslink station be once the shopping centre is redeveloped? 9. Elephant Road is critical to understanding cycle access from Walworth Road – what is proposed here, how will it connect under the rail arches (space for bi-directional cycle paths on the south, and a crossing north towards Newington Butts along the eastern side of the viaduct) and how will that be kept from being compromised in safety terms with a potential future entrance to the redeveloped shopping centre site. The current road has no proper parking controls, the cycle lane has been eviscerated by the adjacent development, but with care this could represent a sensible pedestrian and cycle route south from the Underground stations. 10. Subway Murals are valued by some, it is important to look for a new place to display them once the subways have gone. The Elephant & Castle Neighbourhood Forum are holding a conference on Saturday 28th September 2013, the venue is the Rockingham Community Centre, Falmouth Road, SE1 6RQ. Vegetarian lunch, tea & coffee will be provided. All are invited – in particular they are looking for active members who can contribute to the running of the Neighbourhood Forum. Please forward this invitation to others in the community, TRAs or local community organisations. The Neighbourhood Forum conference will also a space for us to learn about what each group or area is doing, so do please bring leaflets or details of your own interests and activities. The event is supported by Walworth Society, East Walworth Green Links, Rockingham Community Association, Friends of Nursery Row Park, Southwark Living Streets and Elephant Amenity Network. Last week (16/07/13), in a remarkable victory for transparency and common sense, the Information Commissioner’s Office have ruled that Southwark Council have to release the “viability assessment“, the “secret” document that formed the basis for their approval of Lend Lease’s planning application for the Heygate Site (12/AP/1092). This is the document that Southwark Council and Lend Lease kept secret even from the councillors on the planning committee who approved the planning permission (see earlier “Rubber Stamped” post below). Whilst this seems a dry subject, this ruling has very important implications for the Elephant and Castle and for Southwark Council’s future relationships with developers. The Commissioner makes a number of very clear points which will affect future “disposals” of council-owned land to private developers. In support of Lend Lease’s planning application, Southwark Council had argued that the “viability assessment” is commercial and confidential – this assessment was used to justify Lend Lease’s many deviations from the Council’s own policy on grounds of “non-viability” (i.e. that adherence to policy would unacceptably reduce the developer’s financial return). This despite it relating to the disposal of a significant site currently held in public ownership in central London. Interestingly, given that the council’s Compulsory Purchase Order was signed off the following day, the Inspector rules that “whilst the council has claimed that the development is commercial in nature, it has simultaneously claimed that the scheme is public in nature in order to exercise its compulsory purchase order (CPO) powers. The Commissioner considers that the information is clearly commercial in nature, and has concluded that this element of the exception is satisfied.” By implication this suggests that the CPO decision is also unsound. Given the unusual strength and detail set out in the Commissioner’s case for release, we call on Southwark Council to accept this decision now and rapidly release the “Viability Assessment”. This document will give the public, including existing Southwark residents, and former Heygate residents, an insight into the financial deals their elected officers have been doing apparently in the public interest, and could also indicate the value Lend Lease put on the homes of those who have been forcibly rehoused, and allow them to form their own views. As the Commissioner says, “in relation to the general public interest in transparency and accountability, the Commissioner’s general view is that, where this relates to planning matters, there is a strong weighting in favour of encouraging public participation and disclosure is a means of promoting this.” We cannot see how Southwark Council can disagree with this. If the Council appeal the decision it will be from a position of extreme weakness, and will serve only to emphasise the unnacountable, and thus unacceptable, behaviour of the public officers involved in the Heygate redevelopment. At just after midnight, Lend Lease’s outline planning application for the Heygate site was approved by the planning committee by four votes to two and one abstention. The 50 seats at the hearing that were offered to locals were a highly visible demonstration of the lack of understanding shown by council officers of the interest and concern that the local community is showing in the proposals for the Heygate site. In fact at least twice the number of seats were needed, with some of the applicant’s agents (including from Soundings and MAKE) occupying seats that could have been taken by local residents and voters. It concludes “So councillors now depend on Lend Lease reassurances. Can Lend Lease find the money to deliver the scheme during the next decade likely to be dominated by fiscal austerity and overshadowed by economic uncertainty? Southwark residents won’t politically forgive councillors if the loss of 1,200 Heygate council homes ends with stalled development and silent building sites surrounded by hoardings.” We couldn’t have put it better ourselves. Huge thank you to Walworth SE17 (https://twitter.com/se17) for reporting the evening live blow by blow. Southwark Council officers have recommended wholesale approval of their chosen development partner’s (Lend Lease) outline planning application for redevelopment of the Heygate Estate. No surprise there perhaps? Actually, yes. In this case, the scale of the betrayal of the local communities affected is so great as to almost inspire awe in the chutzpah of the officers involved. The developer proposing only 500 or so “affordable” (below market rent) units, about a quarter of the total. Much of it very unaffordable if you can only pay council rents. To be clear on this, Lend Lease are currently offering 1 bed flats in “One the Elephant” at £320,000. This is after a proposed doubling of the density of buildings on the site. Local policy, adopted by the council last year, stipulates 35% affordable housing. The developer replacing 1,000 social rented units with what looks like 71 in the new development – surprisingly, for such a crucial aspect of the redevelopment proposals, it’s hard to tell what the actual number is; details are tucked away in a table deep in the report. We still await confirmation. Officers refusing to make public details of the value of the land they are giving to Lend Lease, or the reasons for approving plans contrary to local policy, saying that anything more generous would not be “viable”. In fact in almost all key areas the officers hide their refusal to explain “viability” on reasons of “commercial confidentiality”. This means they are hiding all financial details of their transaction with Lend Lease, transferring public land to a private company. We, the community, should apparently take their word for it. The developer refusing to give any real guarantee about the retention of the 400+ mature trees on the site, with the council instead claiming their ecology officer thinks the redeveloped area (perhaps in 50 years? They don’t say) will provide “enhanced biodiversity.” They have, however, guaranteed they will remove 283 mature trees. This includes all trees on the south side of the key Heygate St tree avenue. Removal of these trees, officers say, is to “facilitate road narrowing and the creation of residential front gardens” even though elsewhere they state one of the objectives of their tree strategy is to retain existing trees in all of the civic spaces and small gardens! The developer providing 616 car parking spaces plus “a large number of motorcycle parking spaces” plus an unknown number of car club spaces. This will equate to an area at least the size of two Wembley Stadium-sized football pitches devoted to residential parking and access. This is in spite of the site having the highest public transport accessibility scores possible. And, most importantly, despite the council’s policy (adopted last year) being that any housing developed in this area should be “car-free”. Even the recently approved St Marys Residential tower (also from Lend Lease) has a far lower 16% car parking. The developer explicitly ignoring impacts on longer distance cyclists passing through the area, even though the development is the nexus of many longer distance routes from Walworth, Bermondsey, Peckham and Camberwell and beyond. The developer saying that they will resolve road congestion caused by the development by widening the Northern Roundabout to “a full five lanes” despite the terrible history of death and injury caused by conflicts between cars, buses, cyclists and pedestrians at this location. That the currently public roads and paths in the development, and the proposed “public park”, will in fact be policed and managed privately, in the way MORE London is. This means management policies will be able to be invented by the developer on a whim with no democratic control. Officers say in their report they don’t see any difference between this and council management. If this is so, why not stick with council management, as the community has requested? The hearing is next Tuesday 15th January (see post below) where you can come and express your concerns and show the planning committee that we all care about what happens in our neighbourhood. It will be a chance to watch officers attempt to defend the indefensible, but hopefully also to see our councillors do the right thing. Council Planning Officers have now produced their recommendation to approve Lend Lease’s outline planning application. Please note that members of the public are also invited to attend an “informal briefing” on how the councillors and officers propose to run the planning committee meeting (noting that this is apparently the biggest planning application ever in Southwark) at 17:00 on the same day (15th January, 201) and at the same venue. We have objected to the current planning application on many grounds – lack of affordable housing, impact on trees, poor sustainable development, density of development etc. (view brief summary here..). We want our objections to be given a fair hearing when the applications are eventually presented to committee, probably in January and February, but the way the rules are at the moment objectors will only get 3 minutes between them to make their points. This is plainly completely inadequate for such a large development and we have written to the Planning Committee asking for a more sensible arrangement. We are inviting local objectors to a meeting at 7pm on Tues 11 Dec at the Crossway church on New Kent road. This will involve discussing how best to approach the hearing and ensure that we make best use of any time or methods for voicing our objections. 7pm Tues 11 Dec 2012 – Crossway Church 100 New Kent Rd SE1 6TU. Please come along if you can and let us know your views. Candidates vying to be elected in the upcoming East Walworth by-election will be grilled on vital local issues including the Elephant & Castle regeneration. A special by-election hustings event will take place at the Crossway Church on Tuesday 27 November, to give local residents an opportunity to pose questions to the by-election candidates. All issues will be on the agenda but there will be a particular focus on topics which affect the current regeneration plans in the ward. Topics will include not just the Heygate redevelopment and affordable housing but also East St. market, transport, open space, car parking, cycle routes, sustainability and green spaces. The hustings will be a public open meeting, taking place at 7pm at the Heygate estate’s Crossway Church on the New Kent rd. The event has been organised by the Elephant Amenity Network. 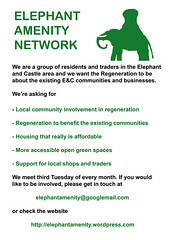 The Elephant Amenity Network has been in existence since March 2009 when a new “Elephant & Castle Regeneration Charter for Community Inclusion and a Better Quality of Life for All” was launched by local people and businesses. Since that time it has organised a coalition of local groups and people that includes council tenants, leaseholders, shopkeepers, market traders and amenity groups. The group is part of a wider campaign by local residents to have more say in the large-scale regeneration plans that will effect the area for generations to come. 3 candidates have put themselves forward to be in the running for the seat following the death of Councillor Helen Morrissey. Voters will get their chance to have their say at the poll on 29 November 2012. Southwark Mediation Centre have organised a public meeting on Thursday 18th October (7pm at Myrrh Education, Flint Street Training Centre, 1 Flint Street, London SE17 1QD). Please come and join the debate and put your questions to those involved. Simon Hughes MP and Peter John, leader of Southwark Council, are attending and we hope Lend Lease are too. 2. Council: Community would like a reduction in density. Are there any other areas where you could achieve the required density (i.e. outside of phase 1 development)? 3. Council: ask Council if employees in charge of S.106 can be present at next meeting? 5. Council: can Viability Assessments be made more transparent, without compromising the process, because it is generating a lot of mistrust? 6. Council: Public land being turned in to private spaces. What can the Council ‘give back’ to the community? 7. Council: how many trees with heritage value are to be felled? What is Council policy? 8. Politicians: ask them what are their requirements for no. of properties (density) on Phase 1? 9. Politicians: ask about Planning Policy – how much responsibility do Politicians have for this? 11. LL said they will come back to the Community with further info. regarding Waste Disposal and how often and where waste collection will occur. 12. LL: what are the ‘other factors’ that can account for the change in affordable housing from 35% to 25%, in addition to: (1) the cut of the grant subsidy from s106 schemes and (2) the strategic transport contributions? The EAN meeting due Tuesday 16th has been postponed to Tues 23 Oct.
As well as this there is also the Overview and Scrutiny Committee meeting Monday 15 Oct 2012 7pm Council Offices 160 Tooley St SE1 2QH, when EAN representatives will be making a presentation about the financial viability of the regeneration. Public are permitted in the public gallery and please attend if you can. The item is first on the agenda, so will be taken early in the meeting.